To mark the start of construction of an Antarctic Supply Research Vessel (ASRV) for the Australian government, an official keel-laying ceremony took place at Damen Shipyards in Romania during August 2017. The ASRV is designed to carry out both research and supply functions in Antarctic waters. With the steel for the ship coming from ArcelorMittal Galati, the vessel represents a continuation of the long relationship between ArcelorMittal Europe – Flat Products and Damen. The marine-grade steels used in the vessel’s hull range from AH36 up to EH36. With their high strength (up to 620 MPa) and low carbon content, these structural grades are ideally suited to vessels operating in polar waters. The dimensions required by Damen challenged ArcelorMittal Galati. One-third of the heavy plates needed to be very thin and wide – from 6 to 8 mm thick and 3,000 mm wide. Thinner plates are typically used for the deck, while thicker plates form the hull. Extra wide plates improve the profile of the vessel and reduce the number of welds significantly. As steel is an important item in the budget, and considering the long-term commercial relationship between the two companies, Damen and ArcelorMittal agreed to a transparent pricing system based on a neutral public index. The agreement creates a fair business environment and a win-win solution for both partners. The proximity of ArcelorMittal Galati to the customer’s shipbuilding yard minimised the chance of transport delays to almost zero. 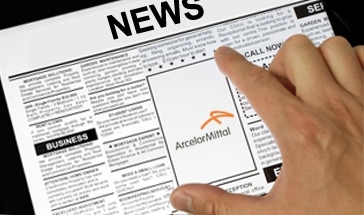 It also allowed the ArcelorMittal Galati team to provide fast reactions when technical questions arose. The ASRV will enable Australia to conduct research in the Southern Ocean and Antarctica, and supply the country’s installations in the region with cargo, equipment, and personnel. The ship can carry up to 150 people and the equivalent of 100 twenty-foot containers (TEU). As it will operate in a polar region, the ASRV is designed to carry ice-breaking equipment. This will allow it to move through ice up to 1.65 metres deep at speeds of 3 knots (around 5.5 km/hour). All construction and outfitting will be completed at Damen’s shipyard in Galati. When complete, the ASRV will sail to Damen Schelde Naval Shipbuilding (DSNS) in Vlissingen (the Netherlands) where it will be handed over to the client. This is scheduled for April 2020. Damen is a leading shipbuilder with a strong international presence. As well as its broad portfolio of standardised vessels, Damen produces a range of bespoke vessels including scientific, hydrographic, naval, and ice ships.